Not long now - let's hope the rain stays away for the big day which is next Tuesday 24th July - the Olympic torch arrives in Ealing. There will be road closures and diversions in operation and everyone's advised to leave cars car at home if possible. The relay will travel at approximately 4 miles an hour and each torchbearer will carry the torch for around 300 metres. 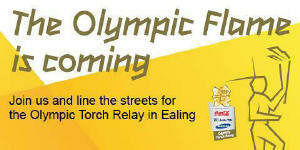 Read the details of the people who will be carrying the torch on the relay through Ealing here. The Olympic Torch arrives in Ealing on Tuesday 24 July, just three days before the opening ceremony at the Olympic Stadium. Get into the spirit of the games by lining the relay route and cheering on the torchbearers – including Ealing Council’s own nominated torchbearers, Tom Thacker and Sydney Richards. Read the information below to find out how to enjoy the Olympic Torch Relay in Ealing. What is the Olympic Torch Relay route through Ealing? The relay through Ealing starts at Northala Fields, Northolt. The torchbearers will then carry the flame towards Southall and along Uxbridge Road through Hanwell, West Ealing and on to Ealing High Street, Ealing Green, and St Mary’s Road, before reaching its final destination at Walpole Park. To view the Olympic Torch Relay route through Ealing at street level, visit the London 2012 website, and enter ‘Ealing’ in the 'Search the map' box. *Entry to the evening event site in Walpole Park is for people with tickets only. If you don't have a ticket you can head to a separate area in Walpole Park to watch the action on a big screen. You won't need a ticket to get into this area but the crowd capacity is limited. What roads will be closed during the relay? A 'rolling road block' will operate during the relay as the Olympic Torch passes along its route. This will result in restricted access to and from some roads adjoining the route for 10 to 15 minutes. Lammas Park Gardens - you will not be able to drive along Lammas Park Gardens from Tuesday midday until Tuesday evening on 24 July. Culmington Road – only residents will be able to drive along the road from the junction of Lammas Park Gardens to Churchfield Road from 6-8pm*. No vehicles will be able to access the part of the road between Lammas Park Gardens and Beaconsfield Road from Tuesday midday until Tuesday evening. Elers Road – only residents will be able to access from the junction with Culmington Road and Carew Road from 6-8pm*. Cairn Avenue – only residents will be able to drive along the entire length of the road from 6-8pm*. Disraeli Avenue – only residents will be able to drive along the entire length of the road from 6-8pm*. Sunnyside Road – only residents will be able to drive along the entire length of the road from 6-8pm. Beaconsfield Road – only residents will be able to drive along the part of the road from the junction with Culmington Road and Lammas Park Road from 6-8pm*. Lammas Park Road – only residents will be able to drive along the part of the road from the junction with Lammas Park Gardens and Beaconsfield Road from 6-8pm*. Lady Margaret Road - if you are travelling South along Lady Margaret Road from 5.30 - 5.50pm (approximately) on Tuesday 24 July, you will be diverted east along Carlyle Avenue and Dormers Wells Lane. You will not be able to travel south onto Palgrave Avenue, Kingsley Avenue or Waverley Road via Burns Road for the time the relay is passing. Uxbridge Road (outside Ealing Hospital) - if you are at Ealing Hospital from 5.40 - 6.20pm (approximately) on Tuesday 24 July, you will not be able to turn right onto Uxbridge Road. Palgrave Avenue, Kingsley Avenue, Waverley Road and North Road (from junction with Burns Avenue) – only residents will be able to travel southbound on these roads from 5-6pm*. Northbound traffic is not affected. *We're expecting these roads to be extremely busy with people and to keep them safe we may have to make resident vehicles wait before allowing them to drive along the roads. How will the relay affect traffic? The relay will have a significant impact on traffic. Vehicles following behind the torch will only be able to travel at 4mph and oncoming traffic will be held up at different times. We recommend that you use public transport wherever possible and leave your car at home.